I have to admit, I'm a helpless romantic and an indie-film junkie. So when "Like Crazy" came around, I knew it would be a must-see. After seeing the film and shedding more than a few tears, it's clear I'm obsessed. 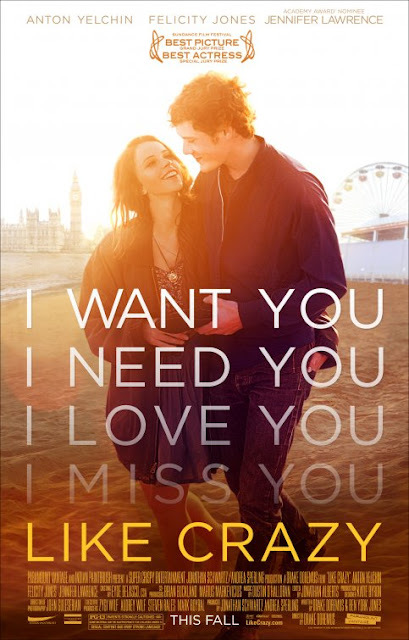 With its raw acting and honest storyline, “Like Crazy” is the love story of the modern generation. So subtly and emotionally, the film dismisses cliché happily ever afters and shows love as it is: real. If you haven't seen it, I highly suggest you do! SUCH a great movie! Obsessed with the soundtrack as well.